That may sound surprising to some people, because laser tattoo removal is a relatively recent industry, and the technology has evolved quickly in recent years. 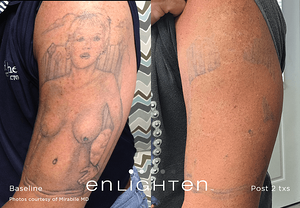 It’s a rapidly changing world, though – and the field of laser tattoo removal is cutting edge. If you’re considering expert laser tattoo removal Boulder County or elsewhere in the Colorado area, we’d love to talk to you and explain your options. This article will give you a foundational grasp on how to approach the process. You might also be interested in reading the frequently asked questions (parts 1 and 2) for more in depth answers. In this article we’re going to discuss some of what you can expect during the procedure and some positive, actionable tips you can use to ready your body and mind for it. 1. Try hard to manage expectations. Laser tattoo removal is successful – most of the time. There are circumstances that could change that, and sometimes a tattoo cannot be removed entirely. In those cases, it will be faded to something much less visible, but you will have a remaining image on your skin. Before committing to even the most state-of-the-art tattoo removal, make sure that you have a conversation with your expert. Any professional tattoo removal provider should be able to give you a clear idea of what to expect, help you to feel confident and well-informed before setting off on this journey. You’ll have to know what your likely outcome will be, and then consider whether the procedure is going to work for you. You should also ask to see before and after treatments. Make sure you’re seeing before and after photos from the expert you’re talking to, not from the laser manufacturer or just Google results. The very best and very worst outcomes in the world can be found online, and that wide spectrum of effects won’t help you make an informed decision. 2. Know that the LOCATION of tattoo ink and SIZE of tattoo matter. Location on the body will affect your tattoo primarily based on vascular supply and healing ability. Essentially, that means that tattoos further from your heart will be harder to remove. Blood flow helps you heal. Because the procedure for laser tattoo removal involves treating your skin with the laser, there will be some discomfort and short-term injury that has to heal. When the tattoo is located further away from your heart, the vascular supply is diminished, and it will heal slower. That makes it harder for your body’s lymphatic system to carry away the broken-down ink. Ankle tattoos, for instance, are pretty tough to remove. They’re not always impossible – so do ask – but they are notoriously difficult. The size of your tattoo will have an obvious effect, as well. Larger tattoos take longer to remove. 3. Colorful tattoos, even blues and greens can be completely removed. Since the advent of laser tattoo removal, darker ink colors like green, blues and some reds have been difficult to remove entirely. Mostly, it’s because the earlier lasers didn’t have the right energy wavelength or speed to do the job. These colors are often are what’s left after a series of removal treatments with the early Q-Switch lasers. However, with the PICO laser technology, this is no longer an issue. In fact, by starting with a fast, more powerful laser like the PICO, the length of time to remove these colors is shortened, significantly – one-third to one-half the amount of time. 4. Professional tattoos are usually easier to remove than amateur ones. This one surprises some people, but it’s true. Tattoos from amateurs and “scratchers” are often much more difficult to treat. This is because professional tattoos, are very evenly inked, which makes the laser treatment more predictable. Conversely, amateur tattoos have an uneven distribution of ink beneath the skin, which can be a serious obstacle. It’s also more common to find minor scar tissue at the site of amateur tattoos. 5. This will not be a one and done experience. You will need multiple treatments. You may see changes after only one session, but more likely, you and your professional laser tattoo removal provider will work out a treatment plan that spans months, and even longer. Anywhere from 5 to 10 treatments could be necessary, depending on your specific tattoo and the challenges it presents. While laser tattoo removal requires a commitment of time, think about the amount of time it took to get your skin art applied. For removal, divide the total time into 15-minute increments and it’s to the same amount of time it took to get the ink. During your initial consultation – at least with our tattoo removal Boulder County team – you will be given a lot of information, including the likeliest timeline for a successful removal. Part of the process is also waiting 8 weeks or even more between laser treatments, to ensure that the skin is healed. 6. This will probably cost more than the tattoo did. With laser tattoo removal, while we make every effort to keep the costs as low as possible, the application of an expensive specialized laser is … well, expensive. The cost will depend on size, location, and number of treatments. 7. Eat and hydrate before your appointment. Coming on an empty stomach, or dehydrated, will probably result in light-headedness or vertigo. Remember, there will be some discomfort involved. It will feel something like having multiple rubber bands snapped against your skin for several minutes. To avoid any risk of faintness or swooning, just make sure you’ve got some calories in your system when you come in for your appointment. 8. Quit smoking. Or at least, cut back. Permanently, if you can manage it. If you can’t, try and stop for the duration of your treatment period. Cigarettes slow your body’s healing processes, and drastically increase the risk of complications that could lead to scarring or infection. 9. Stay out of the sun. Let your sunscreen become your BFF. You’ll want to keep the tattoo out of the sun for at least four weeks before your laser tattoo removal session. 10. Take Tylenol – DO NOT take aspirin or ibuprofen. Tylenol could help alleviate your discomfort if you take it before your session. It’s one of many ways we recommend making the procedure as close to painless as possible. It’s important that you don’t confuse Tylenol or acetaminophen for other mild pain medication, however. Aspirin and Ibuprofen will both cause you to bruise after treatment. 11. Wear loose fitting clothing that doesn’t have to touch the affected area if possible. Depending on where your tattoo is, you may be able to wear clothing that can be removed without scratching or grazing the skin after your treatment. After each session, your skin will feel as if it has been sunburned – dressing accordingly can help you avoid discomfort later that day. 12. Avoid lotion, perfume, and other cosmetics, particularly on the area to be treated. The area to be treated during a laser tattoo removal session should be clean, shaven and unadorned. There’s no need to moisturize your skin prior to treatment, as that has no impact on how the skin will accept the laser. In reality, all we really need is for the area to be completely clean and clear. 13. Ask about anesthetic creams and cold compresses. We make every effort to make the treatment be as tolerable as possible. That includes applying cold compresses, chilled air, or numbing cream to the tattooed area before the procedure begins. As we’ve mentioned the laser “pulse” feels like a bad rubber band snap, or even like getting tattooed again. If you know you may have pain tolerance issues, or if you’d just like to ensure that the procedure is easy, ask us about your options for reducing your discomfort. Modern laser tattoo removal technology is growing more effective, fast and affordable with time. It’s a very viable option for anyone with an unwanted tattoo. If you decide that you want to take that step, contact us. At youbaby Skin Spa we understand skin. Our experience, knowledgeable staff and superior technology, makes us the choice for laser tattoo removal in Boulder County, Colorado. We’re more than happy to answer any and all questions you might have about the process. Our consultations are always personal and complementary.